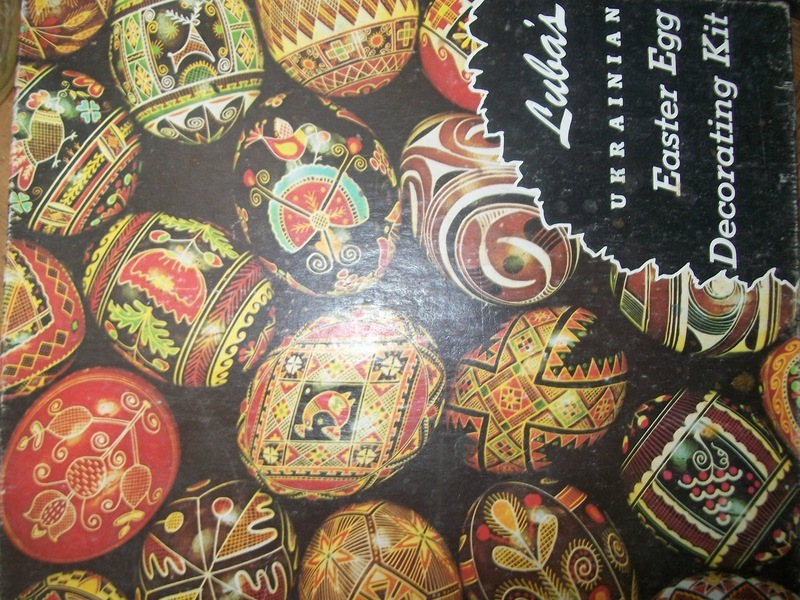 I always enjoyed dying Easter eggs with my German grandmother. It was a yearly tradition. 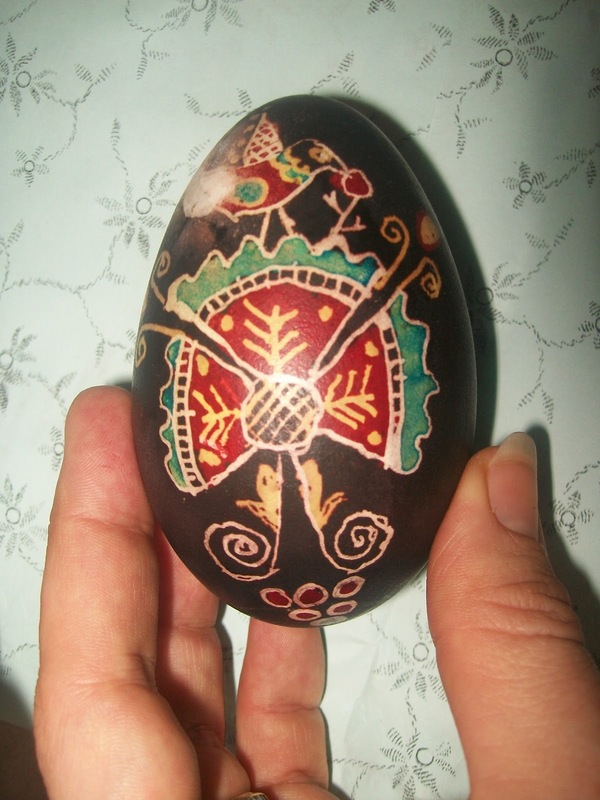 When I was 18 I enrolled in a Pysanky class at the local community college. 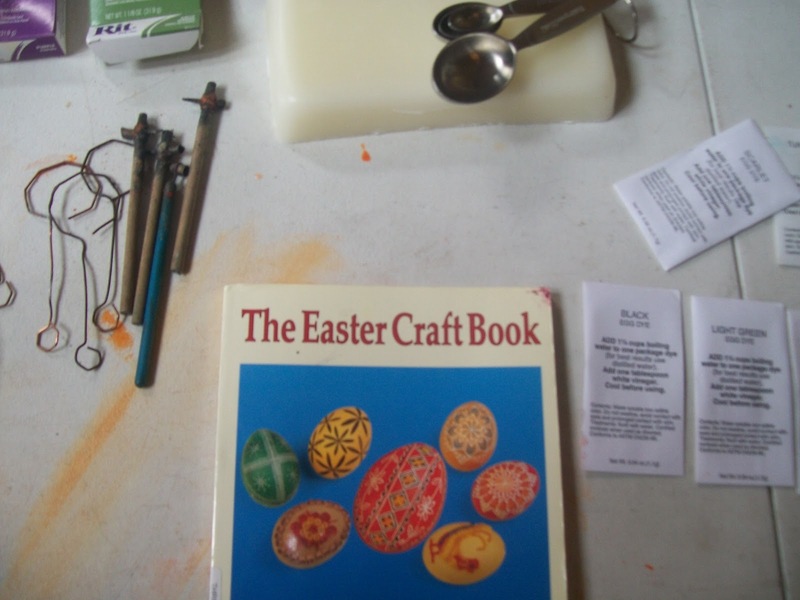 Interestingly, that was the same year I took a basket weaving and bellydancing class. As if I knew what life had in store for me. 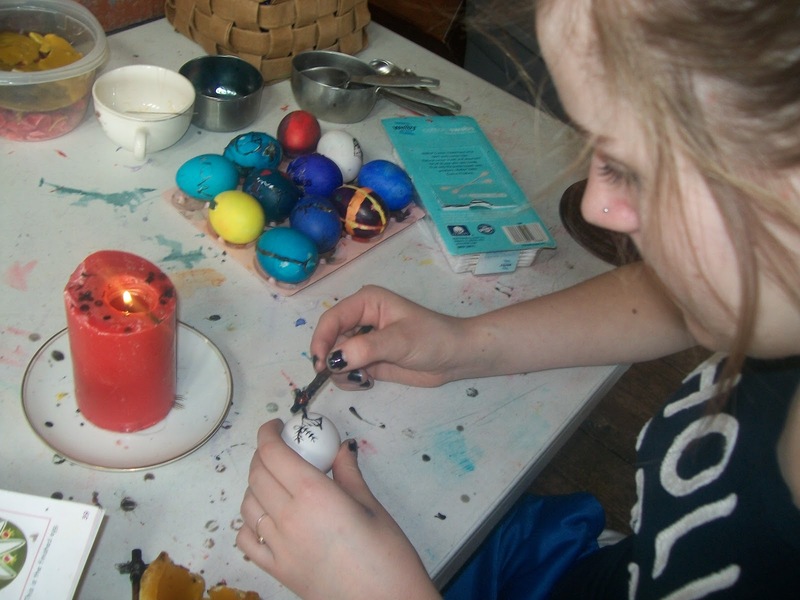 To make Pysanky, or Ukrainian eggs as they are sometimes called, you need some basic tools and household supplies. Every March I set up a work table. I initially bought a basic kit. 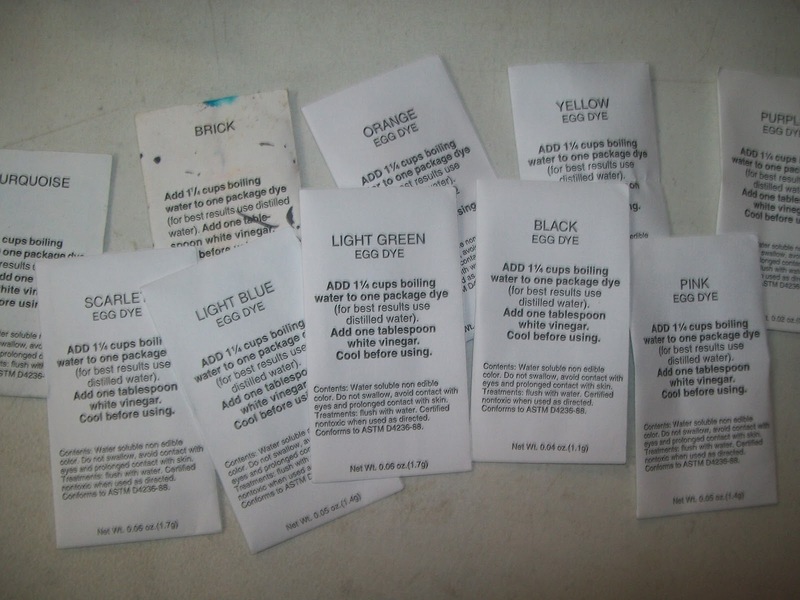 Mix your dyes: Follow the directions for making your dye baths, written on the powdered dye packages. Mine needed 1 1/4 cup water and some vinegar added. 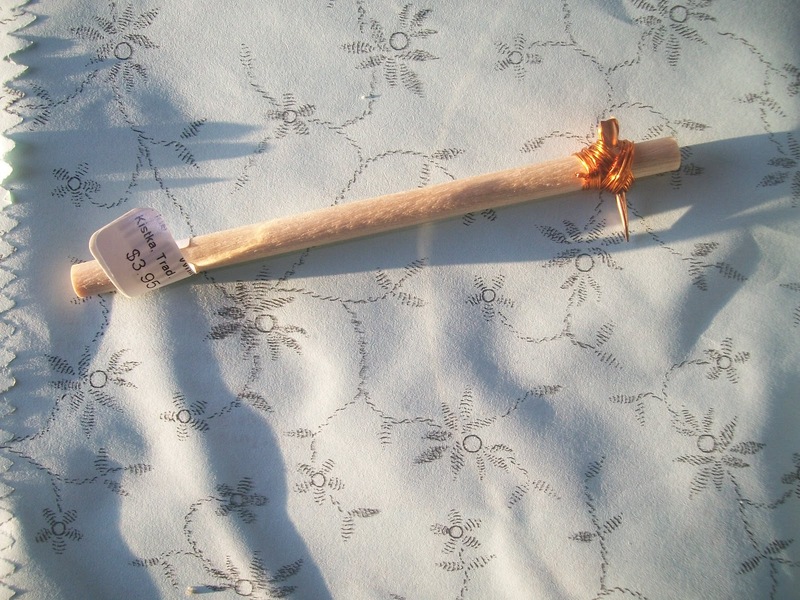 I used dye ordered from Magic Cabin Dolls; you can also use RIT in a pinch, but it totally pales in comparison. Apply wax: Start with an egg, and let it get to room temperature. If it is too cold, the wax won’t stick. You then light your candle and warm your kistka in its flame. 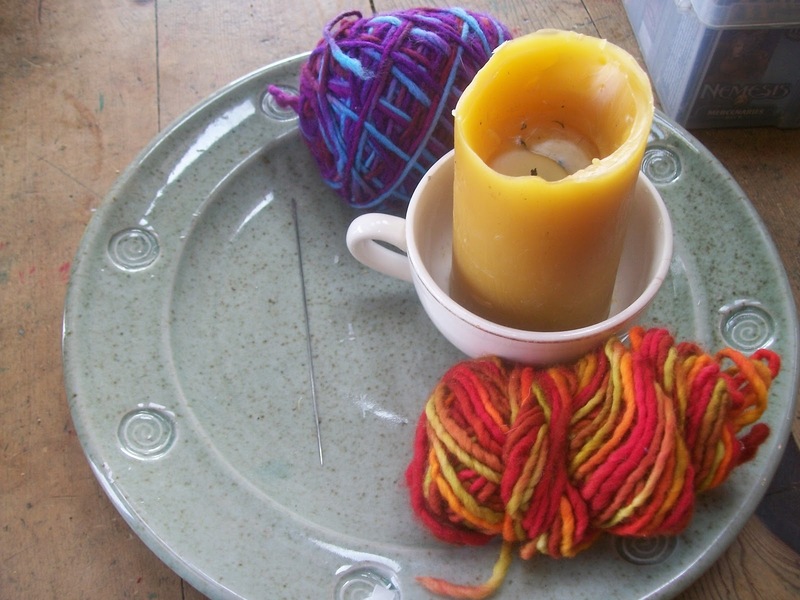 Then scoop a bit of wax and hold it near the candle until the wax is melted. Begin to draw your design. You can draw something as simple as a spiral, or your name. Or you can make something complex and colorful. Covering everything you want white in wax. My wax draws on black because, I think, I use an old kistka and the wax has been scorched like a campfire roasted marshmallow. Your wax might go on clear or yellow. 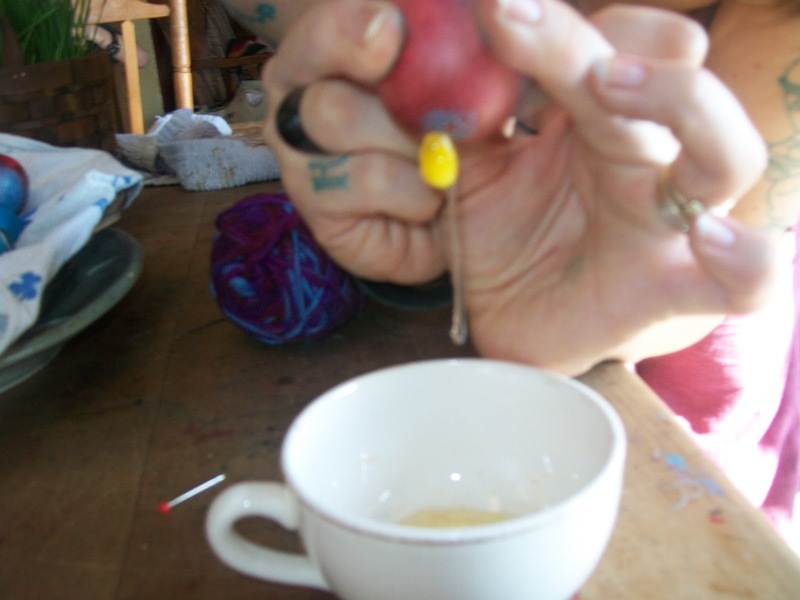 Dye Bath: Put the waxed egg into the next color needed, most often yellow. 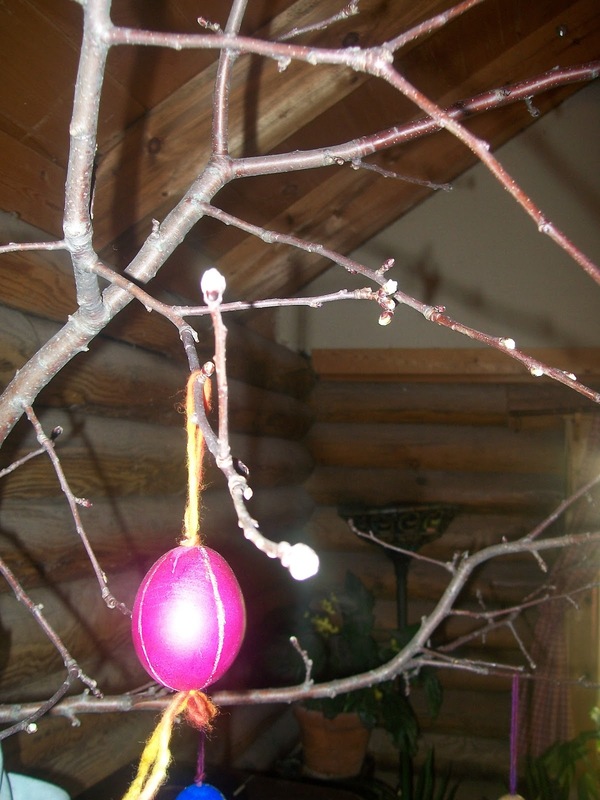 After a while (15 minutes to overnight), remove the egg from its dye bath and repeat the wax process, color by color. Green isn’t applied as a bath, rather it is applied only to the areas desired with a Q-tip. Green is the only color this is done with. 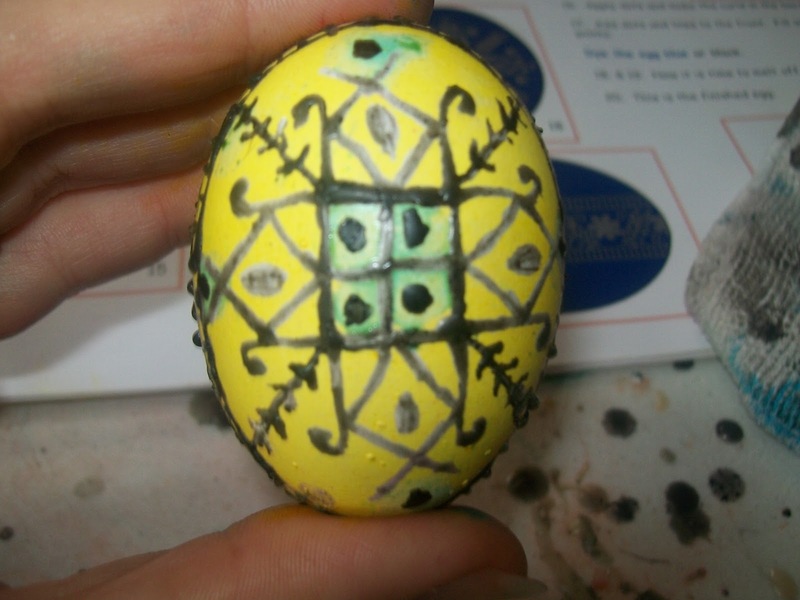 My green sucked this year, as I used old RIT dye instead of pysanky dye. Now more wax. Then orange. 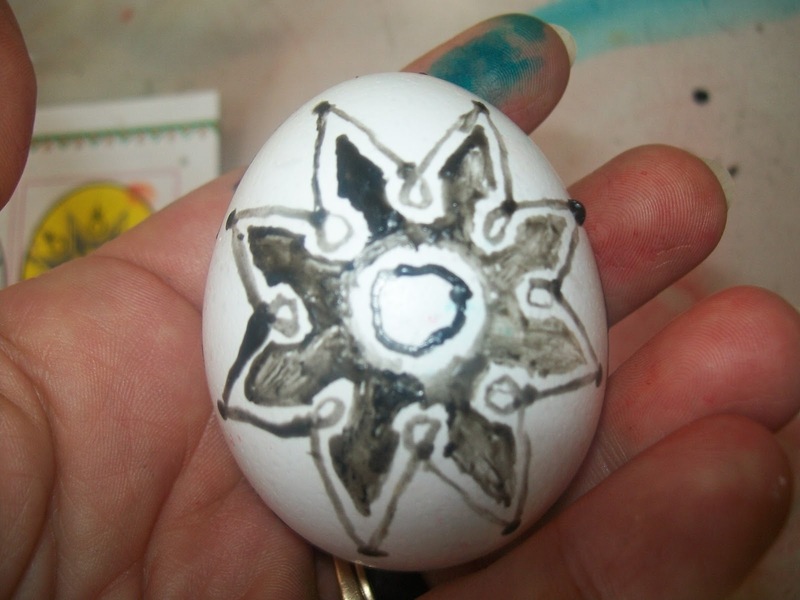 By now your egg is a black waxy mess. 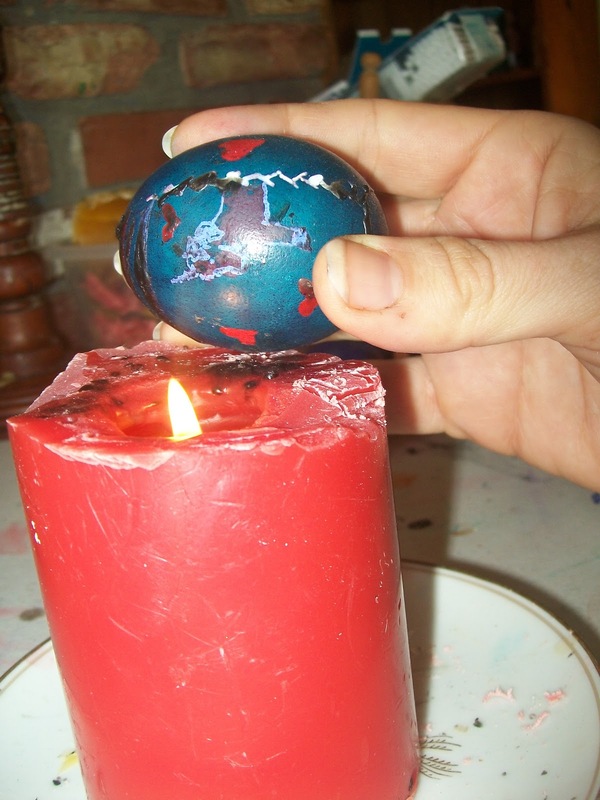 Remove wax: Take your waxed and dyed egg and hold it near the flame. Do not put it directly in the flame because it will get scorched and ruined! As the wax melts, carefully use a rag or tissue to wipe of the melted wax, revealing its colorful brilliance! And be careful! Flames are dangerous! AND this is the point at which many eggs break. I pay my children one dollar if I break an egg they’ve been working on. You can also melt the wax off in an oven. (Instructions below) But you’ll need to blow it out first if you want to hang it. Blowing out your egg: This is another risky egg breaking endeavor. 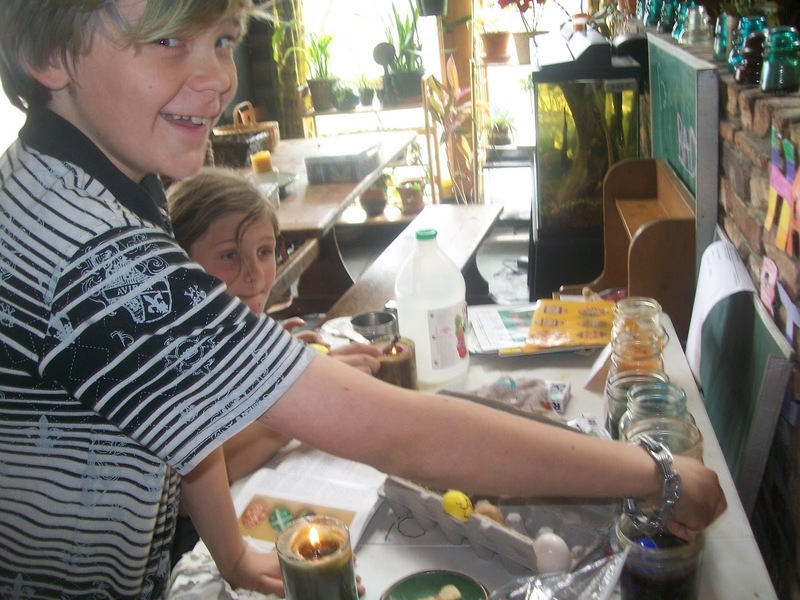 We rarely blow our eggs, rather choosing the traditional method of leaving them intact. 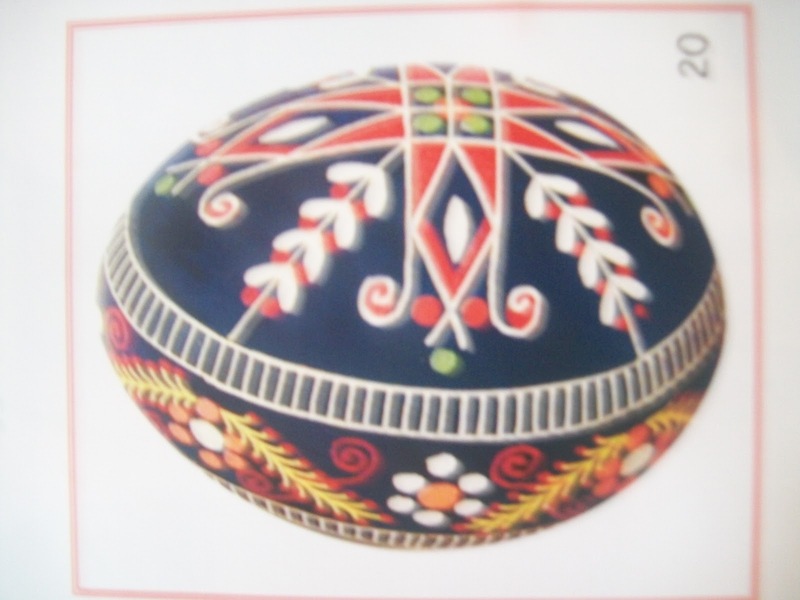 Give them away as gifts as soon as possible. You’ll feel good about it, and won’t be responsible for their destruction. 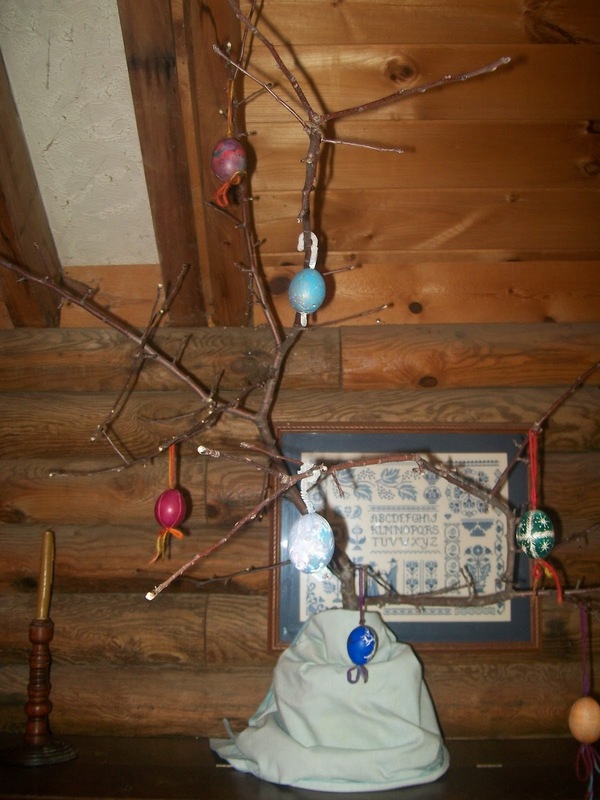 But if you blow them out, you can thread them and hang them on your Ostara branch. Here’s my method. Be careful! 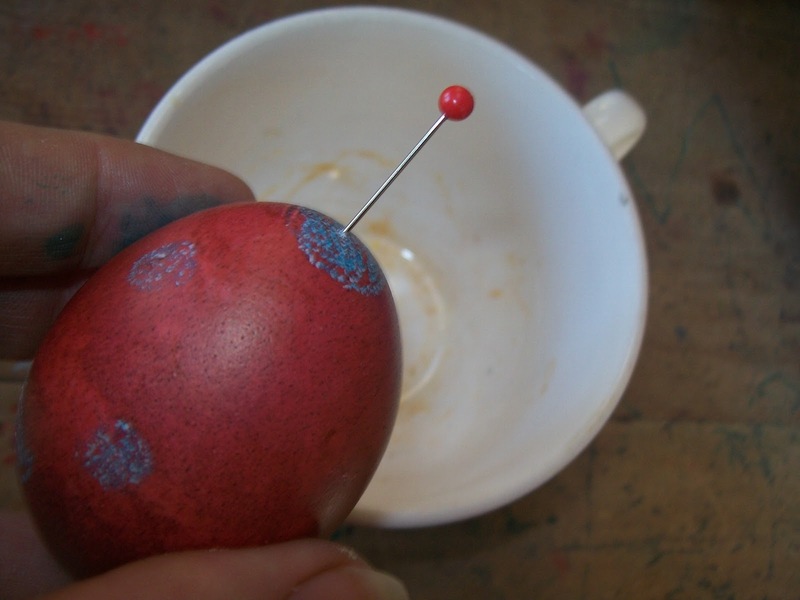 Use a straight pin and carefully poke a hole in the top of the egg. 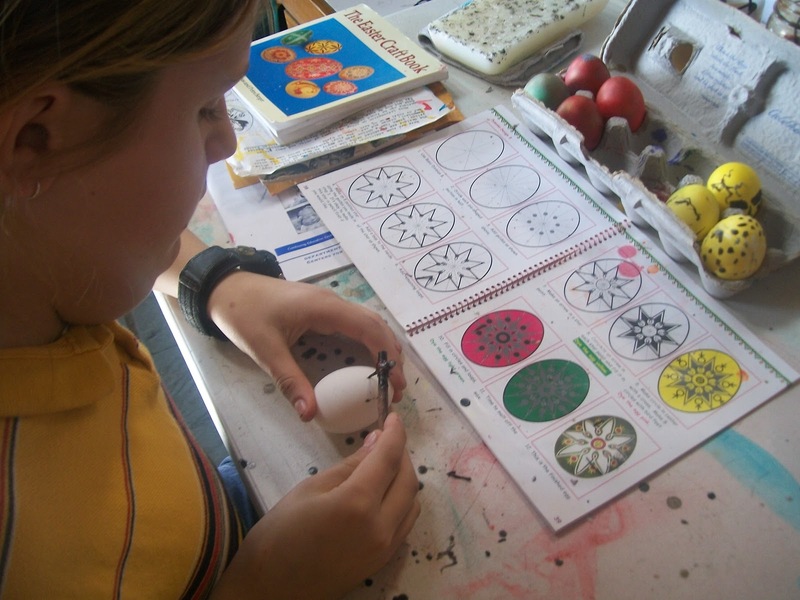 Then turn the egg over and poke a few tiny hole in the bottom of the egg, essentially scoring out a small circle. 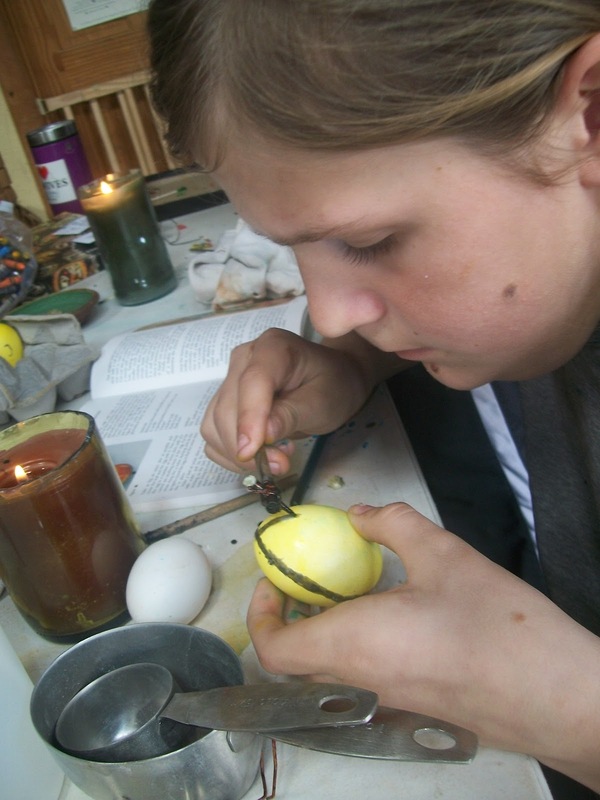 Turn the egg back to small side up and blow, gently but firmly, the egg contents into bowl. The technique takes some practice, so you might want to try this on a few less dear eggs. 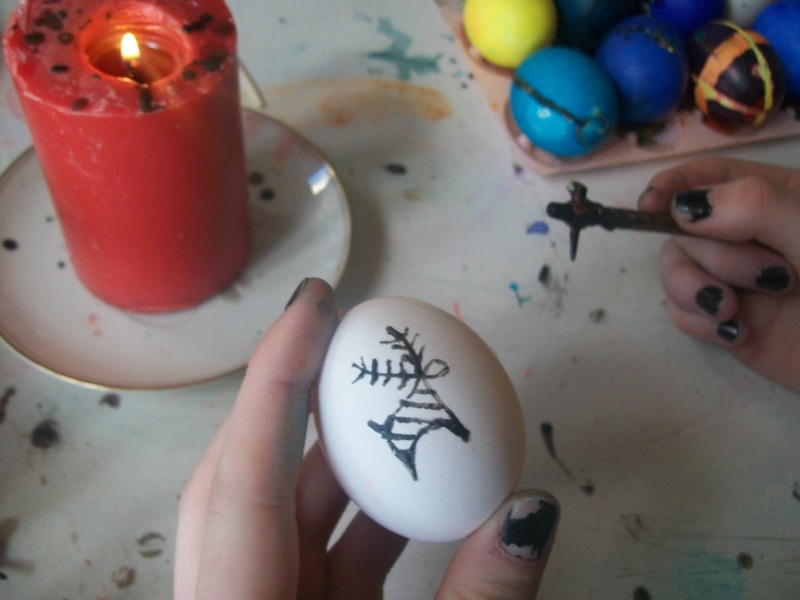 Imagine me above the egg making a face like a trumpet player. 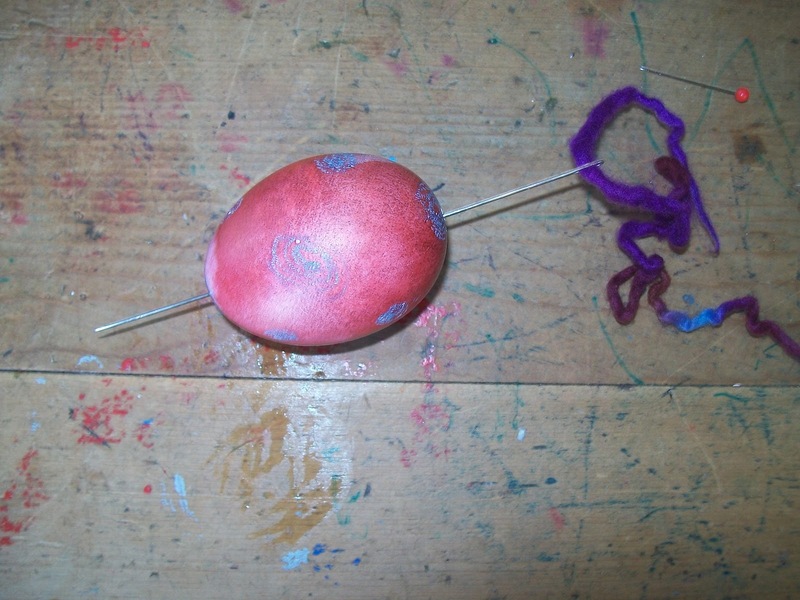 Then you can string your eggs. This year I used a doll making needle and some Malabrigo wool, but ribbon is lovely, and bead work would be beautiful! You can also melt the wax off in an oven. 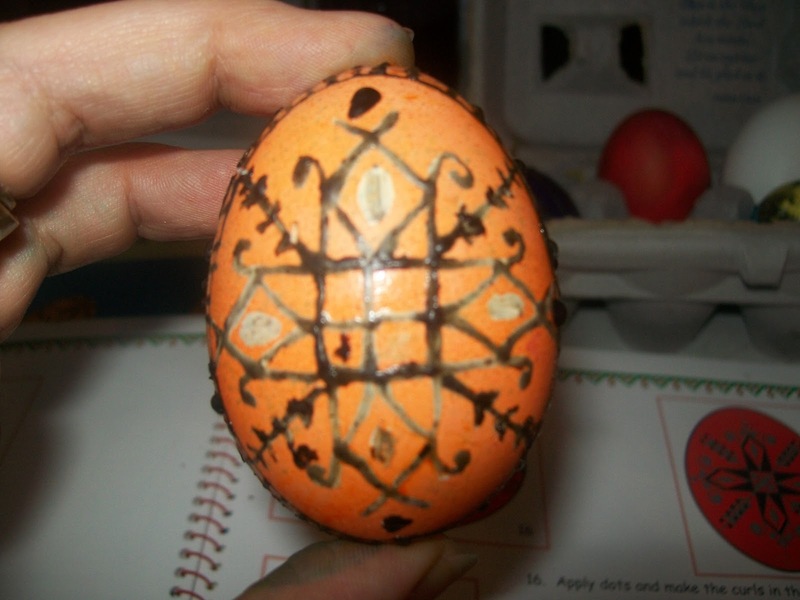 I have been making pysanky for over 20 years, and have never before tried this method. Use a regular oven @ 250 deg F. I balanced the eggs on beer caps on an old pizza sheet. It worked great, but you need to blow out your eggs BEFORE you bake them. Also, I found some of the magic of slowly revealing your design was lost. Watch for the wax to soften, then remove carefully and wipe off with a soft cloth or paper towel. 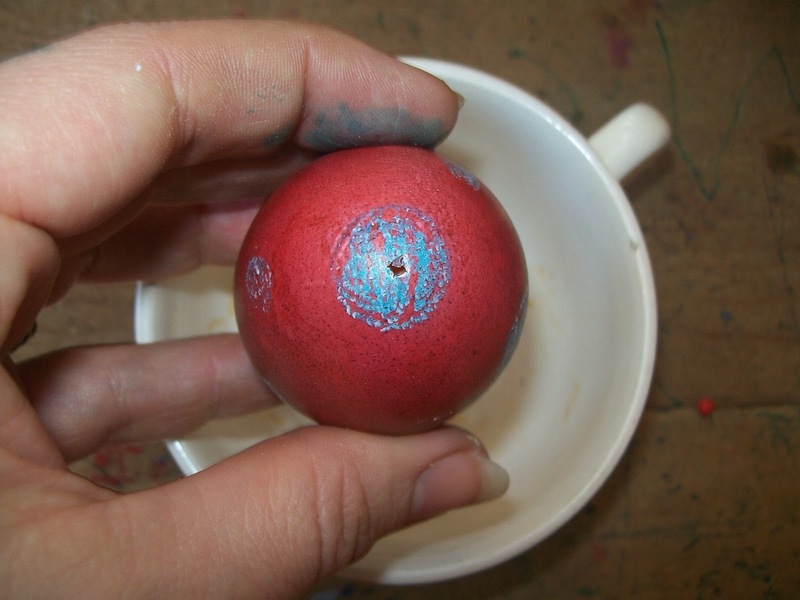 Varnish: Whether or not you’ve blown your egg, the final step is to apply varnish. 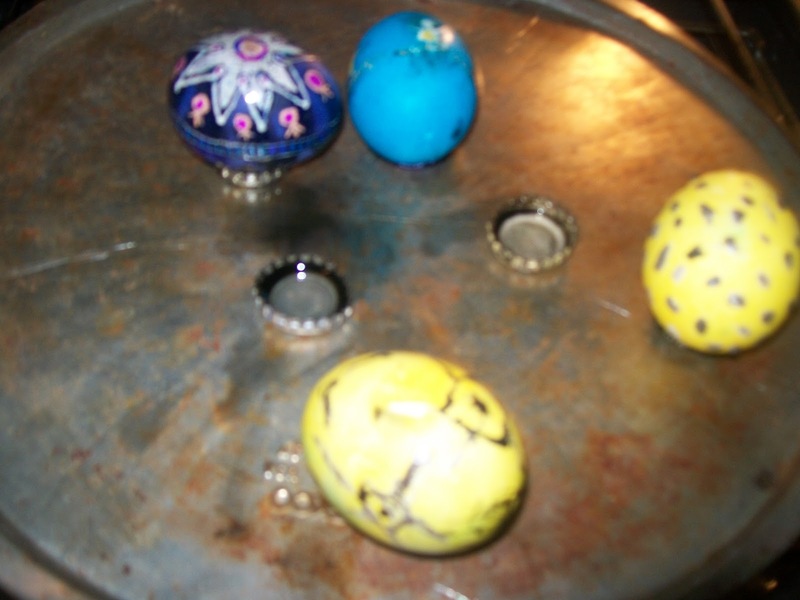 It makes the eggs very shiny and fancy! Spray several thin layers of an oil based varnish. Christopher got home from Paganicon late last night, and look what he brought me. 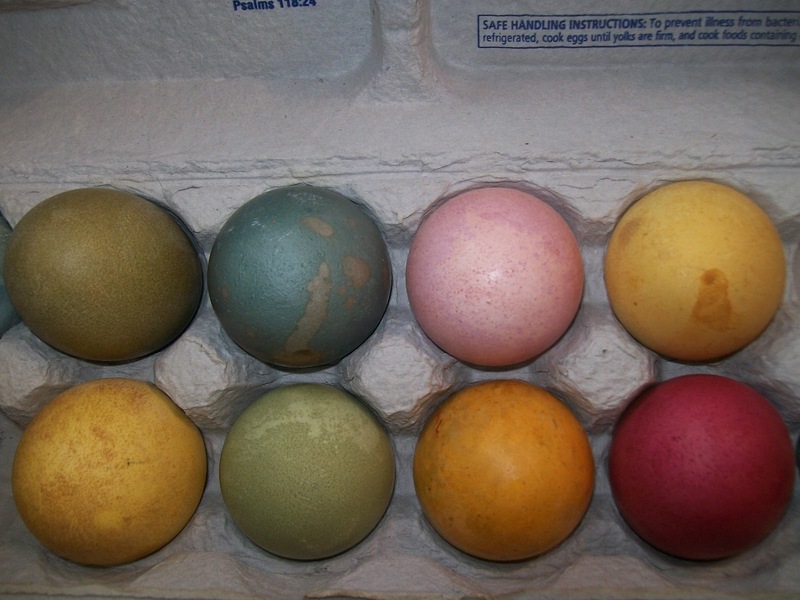 A shiny new kistka and natural dyed eggs from Steven Posch! How are you celebrating Spring? 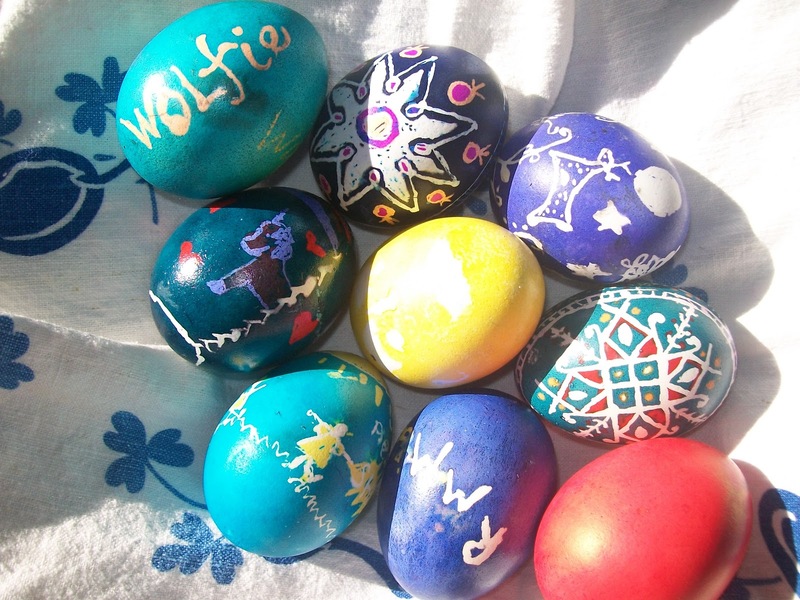 Easter is the name of our holiday. 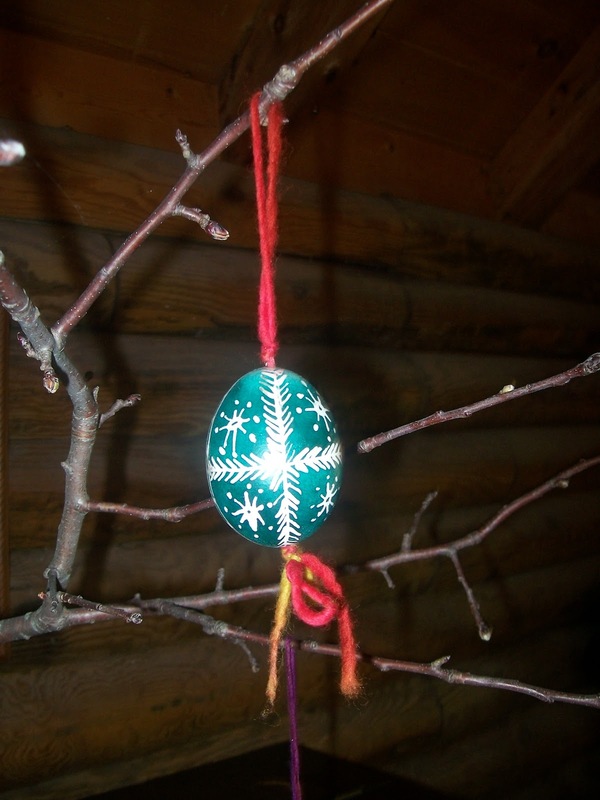 It comes from the Germanic goddess of the spring, Oestre; Austra in Latvian. The name means “dawn”, or “east”, as spring is the dawn of the year. Christians later observed the resurrection of Jesus during this time. I guess life begins again when a woman is in the mood. 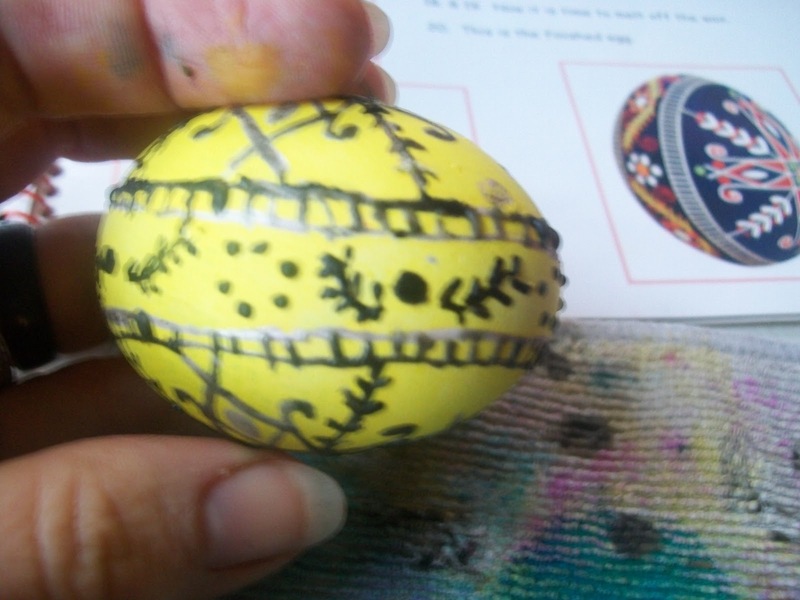 I helped him write his name on one, but he definitely does his own eggs. We use raw eggs. 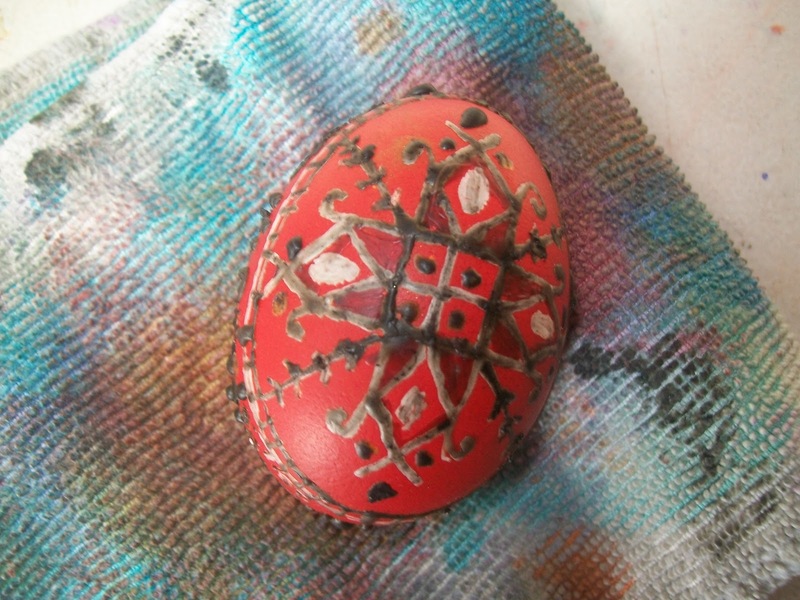 He usually only does one or two colors, and the wax is scribbly. 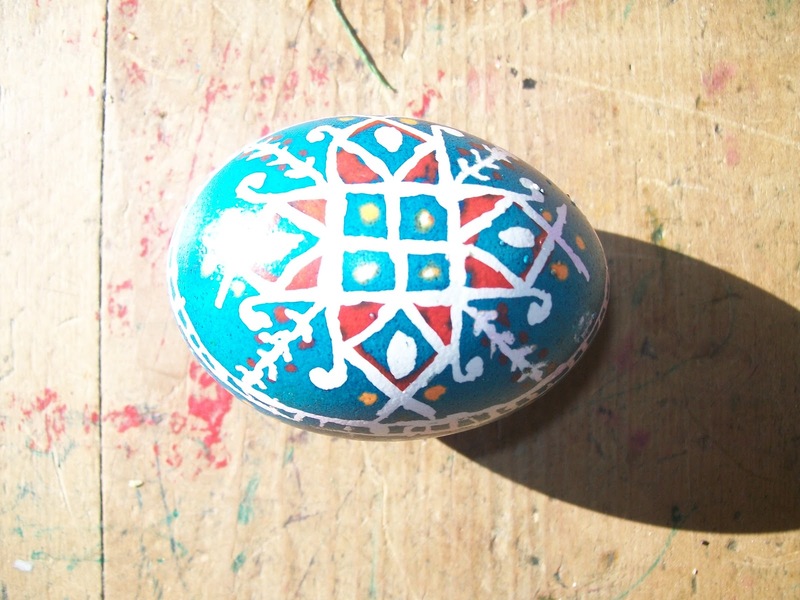 But imagine what a fantastic pysanky maker he'll be one day. 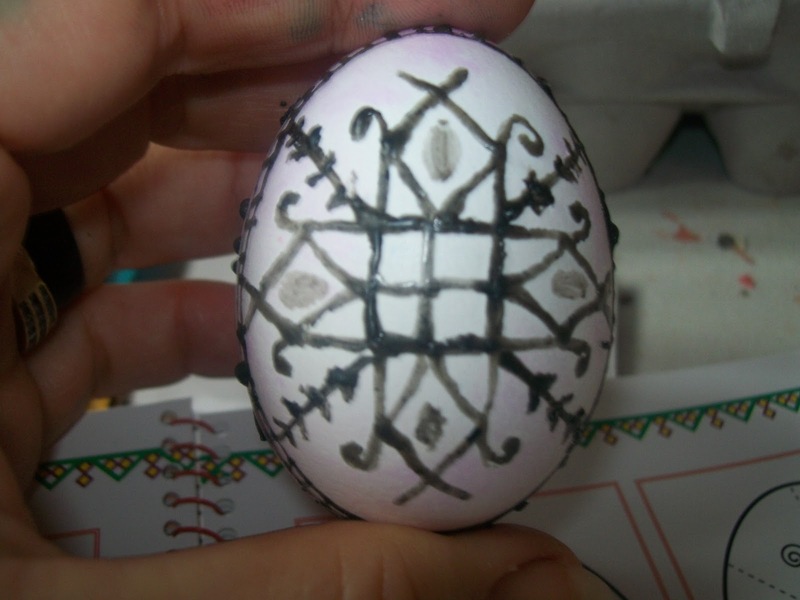 I am always amazed at how skilled my older kids are with a kistka. 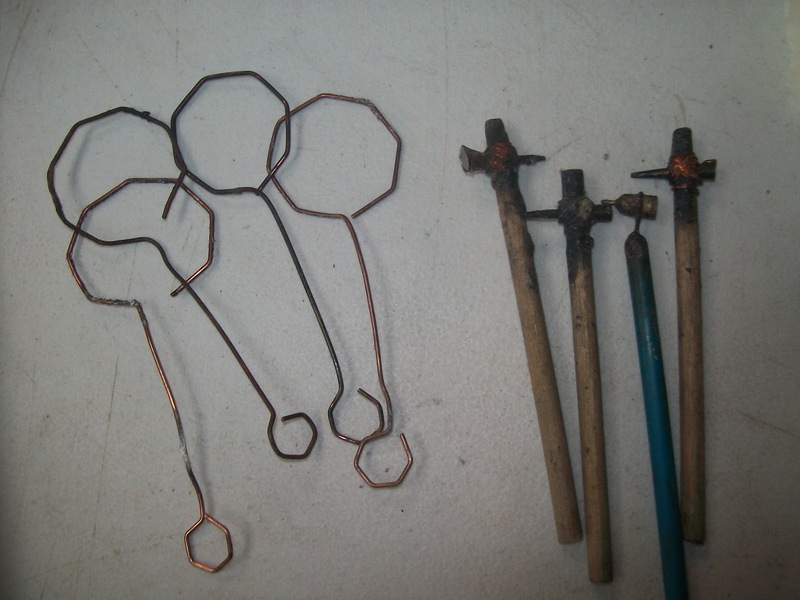 Remember, breaking them is part of the learning process! Oh my. I so remember doing this as a kid. I think my mom still has eggs that we blew out from 20 years ago or more. And she still hangs them up! Wow! What a process. They came out so beautiful! 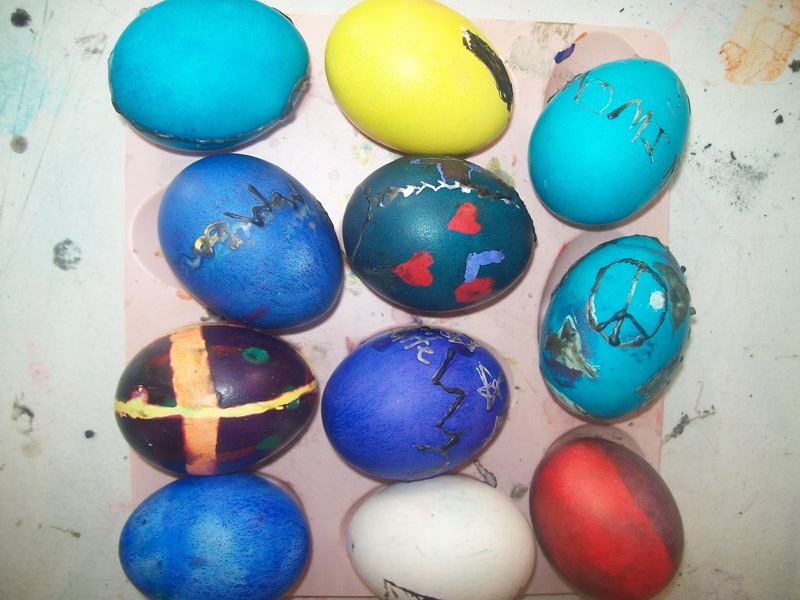 Such gorgeous eggs. I had a friend in grad school that made these. Those are gorgeous. I am so impressed. Really. It makes me want to try it. 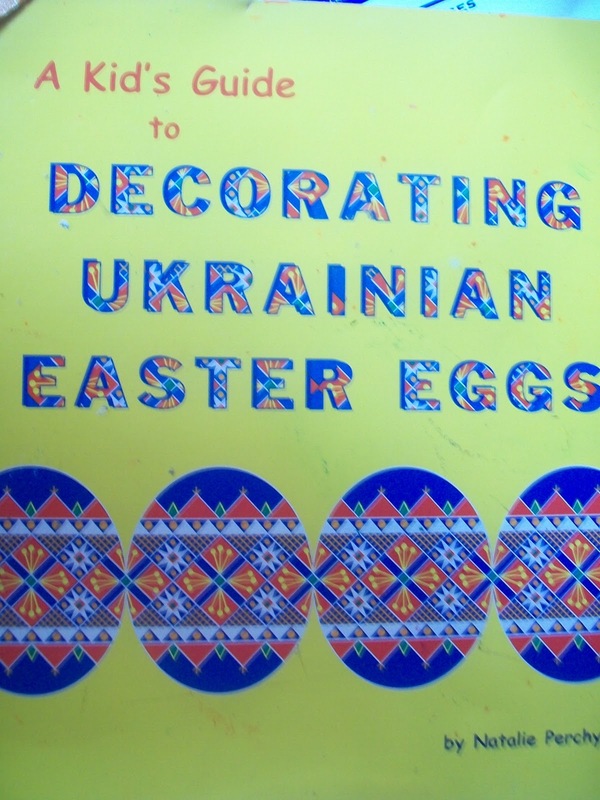 I think I may need to try this , this year …Thanks for sharing Manyhands!! Next Next post: Baby Chickens, Organics and Wine!